Plants only make their own foodright? Not pitcher plants! Most pitcher plants draw in insects with their sweet-smelling nectar and slowly digest them. There is one kind of pitcher plant that likes to snack on tree shrews, too. 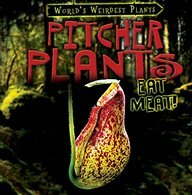 The bizarre eating habits of the pitcher plant are sure to fascinate and delight readers as they learn how this plants digestive system works, its habitat, and more. Full-color photographs and a simple diagram allow readers to see clearly the unique structures of this weird plant.